The 24 pack is for the therapist or school who knows how to use Stetro Pencil Grips and wants to have stock on hand. In addition, the volume pack offers a unit discount. The unit price is R6.25 per grip. Remember, part of how to use Stetro Pencil Grips, is ensuring the arrow on the top end of the grip is pointing to the tip of the pencil. The grip is suitable for both left and right handers, the only difference for use being which finger is placed on the star. 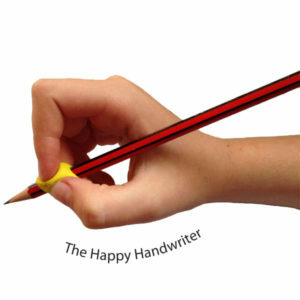 For right handers, this is the thumb, while left handers place their index fingers on the star. The Stetro is my favourite starter pencil grip. Mary Benbow, one of the grandmothers of handwriting intervention, is very clear about the importance of teaching pencil grip. She is adamant that we should not just anticipate a child will learn this on their own. The Stetro Grip is my answer to her wisdom and I have used it with countless numbers of children who are mastering correct pencil grip and reinforced it by ensuring I place one grip on each of their different writing utensils. This ensures each time they pick up their writing implement, they do so with the correct grip. If you are looking for a pack of six click here. We make use of the Stetro Pencil Grip during the Muscle Mania classroom programme presented to our Grade R learners. At the beginning of the programme all our Twisties and pencils we use have a Stetro Pencil Grip on them. This pencil grip is used to teach our children where to correctly place their fingers in order to attain an adequate three-point pencil grip. We aim for a grip with the thumb and index fingers opposing each other on the pencil shaft, and the middle finger supporting underneath the pencil. To help our children to remember where to place their fingers, we sing a song every time they start drawing or writing. What we love about the song is that later on in the year, we only have to initiate the first line of the song and our children will happily continue singing the song while working. The majority of our children will check their grips and assume the correct pencil grip while singing the song. The song, together with the Stetro Pencil Grip assists typically developing children with the adequate knowledge and motor pathways to assume and maintain an adequate three-point pencil grip. Belinda von Wielligh, Occupational Therapist, Green Point.